For an interesting deal check https://blendermarket.com/products/shader-bundle and get 33% off for a bundle containing 4 different shaders. Ultimate Screen Shader is your complete solution for creating realistic LCD, LED and CRT screen materials easily and with a high degree of configuration and freedom. It's 100% procedural and works perfectly with EEVEE and Cycles, and it is suitable both for beginners who expect it to work out of the box, and also for experienced artists who want more control. It doesn't matter if you like abstract art or love realism, you can recreate screens and distortions you want, whether it uses old technologies such as CRT or new technologies like LCD, LED OLED displays. Update v1.1: Fixed compatibility issues with the official 2.79b release. It has been tested with 2.80 Beta (Cycles and EEVEE), 2.79.6, 2.79b, 2.78 and 2.77 and everything worked. Quick to set up : All you need is a single quad plane with a UV. Apply one of the provided material examples, select your image and you're ready to go! Procedural : Everything is created with the standard Blender nodes (math, separate/combine RGB/XYZ, color mix...etc) not only to save video memory, but also to create some effects that are impossible to create by simply using images. There are 240+ nodes in total, but everything is neatly presented in node groups that are easy to read and understand. Works with EEVEE and Cycles : With everyone excited about EEVEE (including myself! ), you're probably going to need to use it with EEVEE. The good news that it's been tested and it works perfectly out of the box! In fact the promotional video and most of the renders are rendered with EEVEE. Modular : It might be unusual to hear this term used for materials and shaders in Blender, but it brings a lot of benefits like the ease of use and the infinite amount of possible combination of effects. Think of "modules" as layers of images and effects in Photoshop, Krita or your favorite image editing software. This also means that you can get rid of all the effects and distortions you don't use. You only want to render a closeup on the RGB pattern? 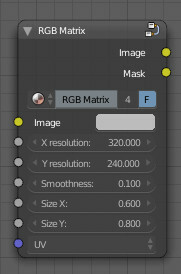 simply use the "RGB Matrix" and the "Pixelize" nodes with your image. Do you want the fringe effect? 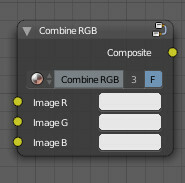 add two more "Distortions" node with different phases, and combine the 3 images with the "Combine RGB" node. or you need to manually resize your image in an photo editing software to make it aligned with the RGB pattern. animatable : I made it possible to create ll kinds of animations when using this node. The demo video is just a simple example of what of what you can achieve with it. 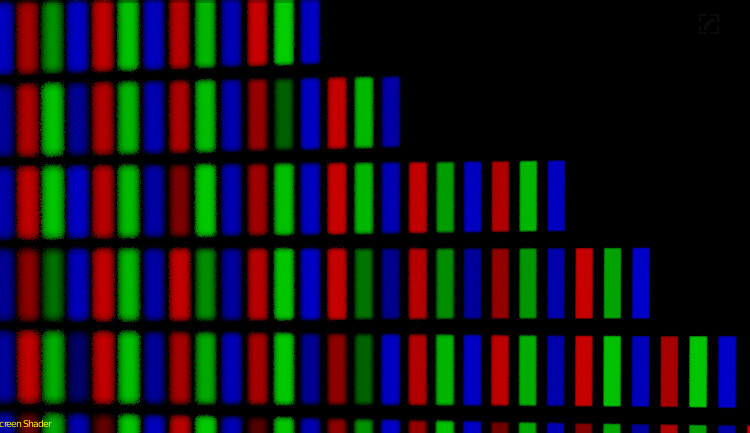 Many filters, distortions and effects : I created all kinds of distortions and effects that you might need such as color and brightness control, screen curvature (curved old CRT TV's or a modern flat LCD/LED TV), static noise, skew, offset, horizontal noise, controllable pattern length and with...etc. Each node is explained in the documentation. because you can't afford to spend a lot of time to create something similar to this, which has 240+ nodes in total. 14.95$ is barely worth 1 hour of your time, and you will need a lot more to create something similar. All you need is a plane with a UV map. You can either append the whole material and apply it to your model, or you can import the individual node groups and build and configure your own setup. There are many different ways to use it, and while the default setup might cover most of the use cases, you might find out that you need to create your own setup. To help you with that, I will explain each node and what it's expected to deliver for you. This node takes care of pixelizing your image and changing its resolution at any time, instead of doing so manually in a photo editing software such as PhotoShop and GIMP. 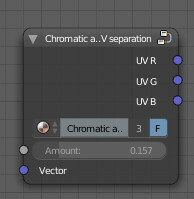 Simply set the X and Y resolution, then plug the "Pixelated UV" output to your image (or other node) UV input. The X and Y resolution outputs are simply for convenience and are made to be plugged into the appropriate slots in the "RGB Matrix" node so you'll have to set resolution only once. This takes care of all kinds of distortions to the image. 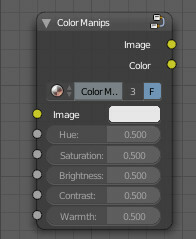 It acts on the UV map, therefore ideally you need to plug this between the "Pixelize 2D" and your image node. 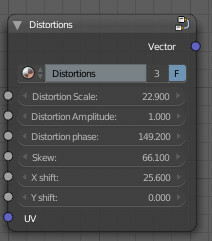 The "Distortion Scale" sets the size of the distortion, similar to the scale of a noise texture. "Distortion Amplitude" is the strength of the distortion. "Distortion Phase" is made so you can animate the distortion seamlessly. All you need is to set 2 keyframes for the beginning and end and it's done. "Skew", "X Shift" and "Y shift" are self-explanatory and can be visualized easily. This is made for convenience, it takes care of separating the RGB channels of each input image, then using the red, green and blue channel of the first, second and third image respectively. It takes care of adjusting the hue, saturation, brightness, contrast and warmth of the image. It creates a rounded rectangle mask to simulate the effect found on old CRT Screens. It is recommended to use it with the "Pixelize 2D" node to have a pixel-perfect result. This takes the resulting image and adds a glossy shader to it and it simulates a curved screen even on a flat plane. 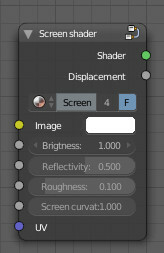 There's also a "Displacement" node that can be used to displace the surface of your screen if you want a real geometrical displacement and not a faked one. This will separate a single UV vector and offset it into 3 separate ones. To be used with 3 image textures and the "Combine RGB" node. Creates a scanline effect, seeon mostly on old monitors. 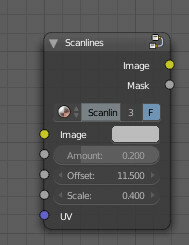 Adjust the amount and scale to your liking, then use the "Offset" parameter to animate it. The name says it all. You can use this to add static noise to your image. I recommend using it with the "pixelize 2D" node. Generally you won't need to adjust the Aspect Ratio, especially if the scale is too big/small, but if you do you can calculate it by the following formula : width/height. Use the "Phase" parameter to animate it. This adds one or many Horizontal black bars on the screen as seen on many old screens (or even newer ones). 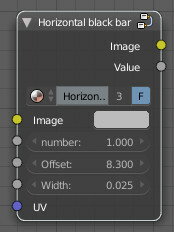 Adjust the number and the width, then use the "Offset" to animate it. This one is probably the most important node. 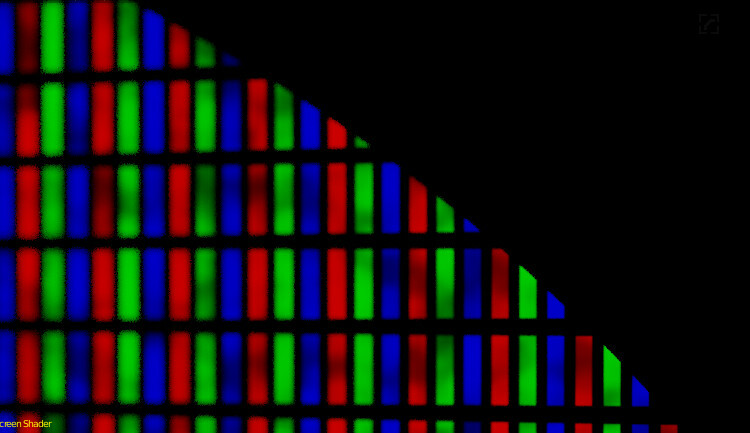 It takes care of creating the RGB pattern seen on each pixel. You can adjust the width and height of each of the subpixels (R,G and B). A smaller subpixel means more dark space between each pixel and the other. Generally their size should be smaller on older screens and vice versa. It is important to have the X resolution and Y resolution the same as the "Pixelize 2D" node, otherwise it will not be aligned. 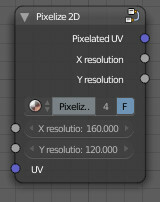 That's why I recommend connecting the "X resolution" and "Y resolution" of the "Pixelize 2D" node with the inputs of the "RGB Matrix" node. 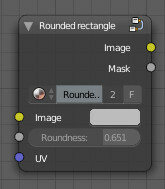 Do NOT connect the UV input to the "Pixelated UV" from the "Pixelize 2D" node, otherwise you will get incorrect results. Does it work well with EEVEE? Can I use a node several times? Yes! 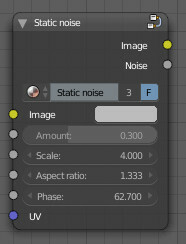 You can for example use two distortion nodes in a row for a more distinct distortion effect, or use 3 of them in parallel with 3 images to create a fringe/chromatic aberration effect. Do I have to use all the nodes? No. That's the main idea behind the modular concept. Only add the nodes you need. Lite version, containing only the "Pixelize 2D", "RGB Matrix" and "Screen shader" Nodes. Get the full version with all the nodes included.